I am a mother / artist in beautiful northern california. I've been drawing and painting since I was tiny, and I graduated with a Bachelor of Arts in Illustration Design. I have since been busy with my family and life in general. My passion for drawing and painting has come and gone in my everyday life, but has remained steady in my heart and soul. My primary media is watercolor. I also use pen and ink, usually combining both medias. 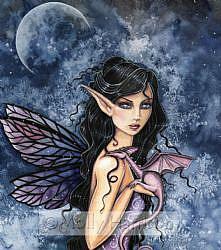 I love whimsical, fantasy subject matter because it can be as strange or beautiful as we imagine it to be. There is no limit! Thanks for viewing my page, and I hope you enjoy my art as much as I enjoy rendering it!